When you bring home a newborn, you imagine all the time you’ll spend snuggling together. What you don’t always think about is the number of hours you’ll spend rocking, walking, and shushing your baby. That time together creates an incredible bond between parent and child but there are times when you need something to soothe your baby while you do other activities. 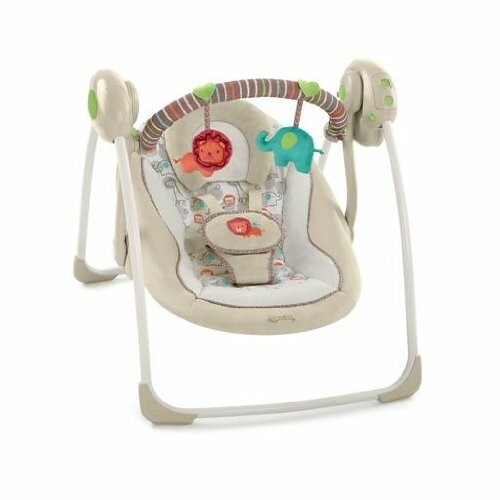 An infant swing can be a lifesaver for a parent looking to grab a quick shower or make dinner. The swing can entertain and keep your baby happy while you have a chance to get some work done. Today, baby swings come in many different designs with features that cater to an infant’s growing needs. As with all baby equipment, safety is always the first concern. The Fisher-Price Snugabunny Cradle N’Swing (FP) has top of the line features. It uses motion, sound, and visual stimulation that can be customized to soothe and entertain your baby. It weighs 24.8 pounds and can hold a baby up to 25 pounds. Every baby is different. In an effort to meet the needs of babies with different preferences, the FP has two swinging motions. The first is a side-to-side motion like that found in a cradle. There is a reason cradles have been used for generations to soothe a baby to sleep. The simple, rhythmic rocking motion feels similar to the motions a baby experiences while still in its mother’s womb. The second rocking motion found in the FP is a head-to-toe swinging motion like that found in a swing you might find at the park for older children. This is the motion that has been used in baby swings since they have been made for home use. Switching between the two swinging motions is easy. It can be done with the click a button and a rotation of the swing handle. Each swinging position also has six speeds. This variation in swing type and speeds gives you incredible flexibility. You can tailor the swing to the needs and desires of your baby each time they get into the swing. Once you find your baby’s favorite settings, you can leave them in the swing knowing their needs have been met. The FP includes Smart Swing Technology. In a traditional swing, as the baby grows, the swing goes slower and slower even though it is set to the same speed setting. Over time, the baby can become less satisfied with the swing. Smart Swing Technology recognizes the baby’s weight when he is put into the swing. It then automatically adjusts the speed settings according to the baby’s weight so that he will continue to swing at the same speed no matter what his size. To make it even easier, the swing can start without a push. Starting a swing with a push isn’t a complete inconvenience, but when you are an overtired parent sometimes you forget to push the swing once the baby is in it. This simple feature can ease the frustration of an exhausted caregiver. The seat swing angle of the FP can also be adjusted. Many babies have a personal preference for recline angle. You can accommodate these needs with a fast, simple seat adjustment. This also works well for newborns that need a deeper recline to support their head and neck muscles. As your child gets older, you can put them in a more seated position to meet their needs. The seat can also be rotated to be left facing, center, or right facing, again, to accommodate baby preference. Newborns may require extra support at the side of their heads. The seat cover of the FP comes with a My Little Snugabunny body insert that cradles the baby and provides the extra support at the head and neck. There is also a plush bunny on the front buckles for your baby to feel and snuggle with. The bunny won’t be lost because it is attached to the harness. Babies can be safely strapped into the seat so they don’t fall out when swinging even when they begin trying to sit up. The seat is lined with a soft, plush fabric that is gentle on a baby’s new skin. The liner can be removed and washed in a washing machine. The FP not only soothes babies with motion, it also uses sound to calm the baby. Once your baby is in motion, you can turn on one of 16 songs or nature sounds. There are some babies that crave white noise. Nature sounds are a soothing white noise that appeals to babies while not driving parents crazy. To engage the visual senses, a moving mobile is mounted to the frame. It can be turned on to provide the visual stimulation that babies crave. They can also learn to track motion, an important developmental milestone. The HP can be powered by both batteries (4 D alkaline batteries) and a 120 volt AC adapter. Battery power offers you mobility and versatility of use. You can bring it outside to keep your baby nearby as you do yard work or into the garage while you work on a project. The downside of batteries is that as they run out of power the swing will slow down while in use and, once it stops, you have to replace batteries. Some highly sensitive babies may be upset by this interruption to their swing time. With the FC you can use the provided electrical plug when you are near an outlet. The swing will run study without loss of power. It can also save you money on batteries in the long run. The FP provides a wide variety of features that can be customized to meet the specific needs of your baby. Most importantly, it is safe and comfortable. 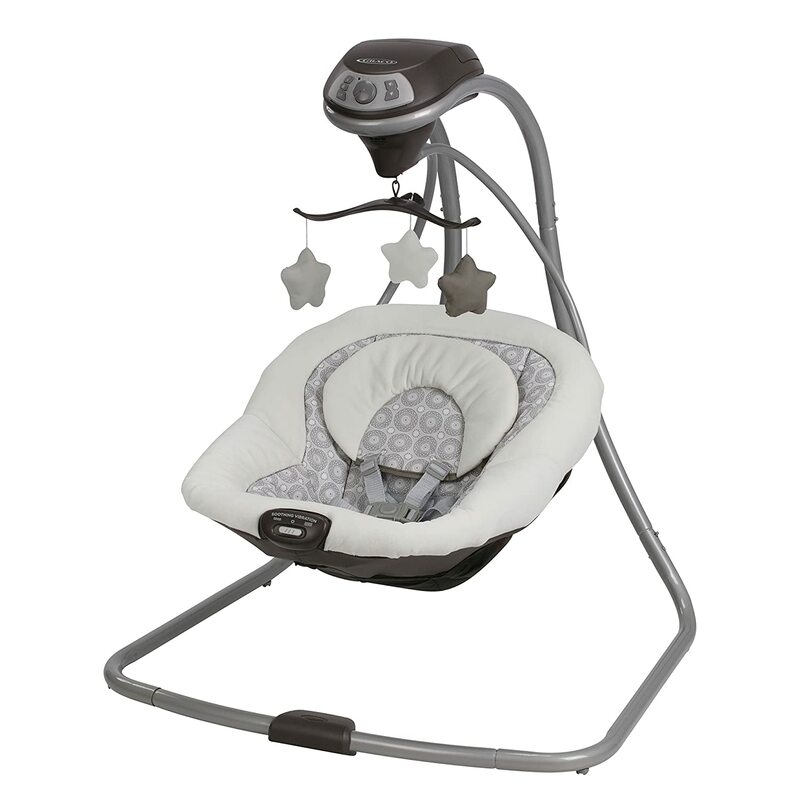 The Graco Simple Sway Baby Swing (Graco) is a swing with a smaller design and fewer features, but it still provides movement and sound to soothe and calm your baby. The dimensions are 39 inches high x 31 inches wide x 30 inches long and it weighs 19 pounds. It can hold a baby up to 30 pounds. Infant swings can take up precious floor space. Although babies are small, they seem to require a lot of large equipment to keep them happy. The Graco boasts a smaller footprint than most infant swings. It retains stability while not having the legs as wide set as other models. For those with limited floor space, an infant swing that saves on space is going to be important. It can fit into a corner between a sofa and wall or between a sofa and chair. Space saving equipment will help you to not feel as though your baby has taken over your entire house. The Graco uses a side-to-side motion like that found in a traditional cradle. This type of motion is familiar to parents and babies. The gentle sway can be adjusted with six different speeds. As your baby grows, you may find that their preferences change. With these different speed settings you can adapt as your baby develops. It also has two vibration settings. Some babies need that extra motion of vibration to soothe and entertain them. Some babies are not satisfied by motion and vibration alone. They crave more. The Graco provides visual stimulation with an attached mobile. The mobile has three plush toys for the baby to watch. While many babies like this mobile, some parents found that their babies preferred a moving mobile. 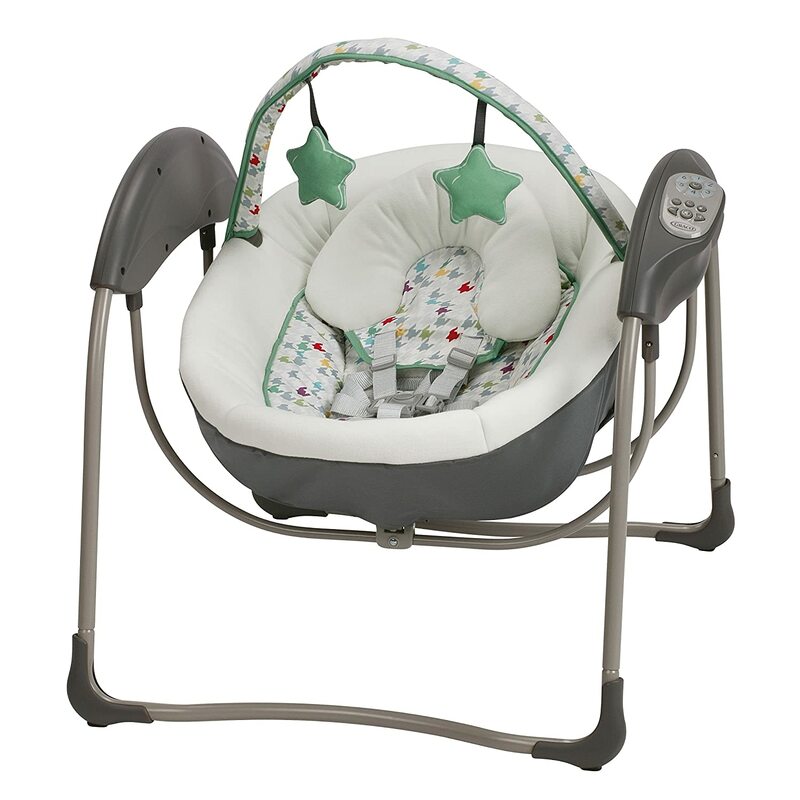 A deep swing seat with head support provides a comfortable place for your baby to sit. The seat pad can be removed and machine washed. Babies are going to occasionally have an accident, so the ability to wash the seat cover in a machine will save you time and frustration. Some parents found the head support inadequate for a newborn. They often rolled receiving blankets to place on either side of their infants‘ heads for stability. The seat also includes a built-in, 5-point harness. The Graco can be used with D batteries or plugged into an outlet. This smart feature gives you the mobility that batteries offer such as when you want to enjoy some time in your yard but also saves you money. Batteries can be expensive if you use the swing every day. Not only that, they always pose the risk of running out of power while your baby is in the middle of a nap. A plug saves you money and can run the swing without the risk of losing power. The Graco Glider LX Gliding Baby Swing (Glider) has a unique design that imitates the motion that a baby feels while being rocked in a glider. This gentle glide motion can help your baby to feel the same security they experience when in your arms. 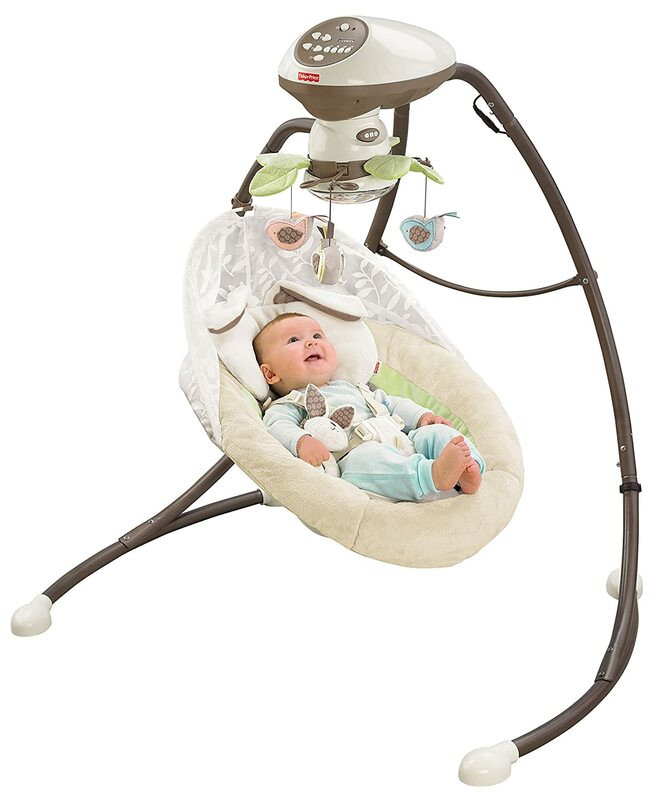 If you have a baby that craves being rocked to sleep, this infant swing may be the right one for you. It is extremely lightweight and can hold a baby up to 25 pounds. At only 12.1 pounds, it can easily be carried around your home to be used in any room or outside while you enjoy some sunshine. This portability is enhanced by the ability to run on D batteries or to be plugged into an electrical outlet. The Glider includes a timer mode that allows you to set a time limit. This feature can save you money on batteries as the Glider won’t keep going after you want it to stop. Because all babies are different and their preferences change as they grow, the Glider is equipped with six speeds. This gives you options to best meet your baby’s needs from the time they are an infant until they reach 25 pounds, the Glider weight limit. You may also discover that you need to change speed settings as your baby gets heavier. As they gain weight, they may begin to slow down at what was once their preferred speed. While many infant swings put a baby to sleep, they need to be able to be entertained until sleep overcomes him. The Glider has a toy bar with two toys for your baby to play with and look at for visual stimulation. You can even attach your baby’s favorite toys for them to play with while he swings. For babies that may not like toys in their face or who are trying to overcome too much visual stimulation, the toy bar can be removed. The swing seat is spacious enough to accommodate a growing baby. The seat cover is plush with a head support to aid your baby until he becomes strong enough to hold his head steady. The cover and head support can be removed to be washed in a washing machine. Machine washing is convenient when a diaper leaks or if your baby spits up. The frame can be wiped down with water and a gentle soap. Auditory stimulation can be just as important as the motion of the swing. The Glider plays 10 songs to peak your baby’s interest. It also has five nature sounds that may be more soothing and easier on a parent’s ears. You have the option of volume control to keep the music at the right level. The Glider provides a good option for those who have a baby that loves to be rocked in a glider. This infant swing is also lightweight and portable. If you frequently need to move a swing from room to room, this swing may work well for you. The Comfort & Harmony Cozy Kingdom Portable Baby Swing (C&H) has the essential features for your baby’s comfort while also offering options that allow you to transport it wherever you need to go. The dimensions are 34 inches x 28 inches x 24 inches and it weighs only seven pounds. It has a 19-pound weight limit. The C&H is foldable for easy storage and portability. If you have limited space or travel frequently, the C&H is easy to collapse and take with you. It is battery operated so that it can be used wherever you need it. It uses WhisperQuiet technology so that the motor is quiet during naptime. The C&H uses a front-to-back motion like a traditional swing. With six speeds, you will be able to find a speed that your baby finds comfortable. This also allows you to adjust speeds to suit your baby’s moods and stage of development. It uses a True Speed Technology that maintains the correct speed as your baby grows. This allows you to use the swing longer. Swings that lose speed as your baby gains weight will quickly lose their effectiveness. Calming a baby sometimes requires more than movement. To appeal to your baby’s auditory senses, the C&H plays six original melodies. There is a volume control so it can be adjusted to you or your baby’s comfort level. Volume control should be a required feature for baby equipment simply because your baby may love the melody but you may need the music to be at a manageable level. The C&H has an automatic timer shut-off feature that allows you to set the amount of time you want the swing to run. This allows you to control how much time your baby spends in an infant swing. Some parents are concerned their baby won’t learn to sleep anywhere else if he only sleeps in a swing. This timer allows you to keep a close eye on how much time is actually spent in the swing. Visual stimulation can be as important as motion and auditory soothing for babies. A foam toy bar with two toys will give your baby something to watch and interact with. Your baby can continue to work on his motor skills as he lays in his swing. The seat offers two recline positions for your baby’s comfort. Having two recline positions is also nice as your baby grows. Newborns will need to be reclined more than a baby that is ready to sit up independently. The seat is cushioned with a soft cover and removable head support. Both the head support and cover can be removed and machine washed. Safety will always be the top concern with baby equipment. An infant swing should always be reclined enough so that your baby’s head does not slump to the side or forward. This is particularly important for newborns who do not have enough strength or control of their neck muscles to hold their head up. Infant swings with several recline positions will allow you to adjust to the level that is best for your baby. Look for swings that have head and neck supports that are built-in or can be added. Your swing should have a 5-point harness to securely hold your baby. Once you’ve put your baby in the swing, check to be sure that the harness is adjusted correctly so that your baby cannot slip out the side, front, or back. There are several different types of motion provided by infant swings. There are traditional swings that use a front-to-back motion, a side-to-side motion, a gliding motion, and a circular motion. Some swings offer several different types of motion while others only have one kind. If you are purchasing a swing after you’ve had your baby, look for a swing that closely resembles the kind of movement that they prefer. Babies that like the swaying motion of a cradle will probably prefer a swing that moves side-to-side while a baby that likes to be walked around may prefer a swing with a circular motion. If you are purchasing a swing before you’ve had a baby, you may want to consider a model that offers more than one type of motion. This would give you options when trying to find what your baby prefers. There are two basic types of swings – full-sized and portable. Take a look at the amount of space you have in your home. Do you plan to have the swing out all the time or only when necessary? Do you want to be able to move it from room to room or keep it in one place? If you plan to travel frequently, have a small home, or have limited storage space a portable swing makes the most sense for you. However, if you want the swing to be in your family room and that’s where you want to keep it, a full-sized swing will probably be the best choice. Some swings come with onboard entertainment like a movable mobile, music, and vibration. The more entertainment features the swing has, the higher the price will be. You need to decide how important these types of features are to you. Some babies can become over stimulated with too much entertainment while others can’t get enough. 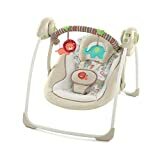 To be sure that you aren’t stuck with a piece of baby equipment that your baby hates, look for a swing with entertainment features that can be shut off or removed from the swing. Music should be able to be turned down or off entirely. Toys or mobiles that can be removed are a good idea in case you have a baby that needs less stimulation rather than more. Your baby is only going to be able to use an infant swing for 6 – 9 months. Some swings can be converted into a baby bouncer or used as a baby seat. Swings with these capabilities are going to last longer and give you a greater return on your investment. Babies are messy. There is no way around it, accidents and leaks are going to happen. Be sure that all parts of the infant swing are washable. Look for a cover that can be easily removed and washed. Those that can be machine washed will be the most convenient. Also, check on how to clean the frame as messes can spread farther than you might think. An infant swing can become your go-to piece of baby equipment when you need a break or something to soothe a fussy baby. You can narrow down your choices are you consider your lifestyle and what features are most important to you. There are quality swings available in all price ranges. You should be able to find a swing that meets your needs.